Today I'm going to tell you 4 easy steps I got Google Adsense Approval after so many trials and condemnation by Google Adsense policy enforcement agencies. Fortunately, this adsense approval trick that would be discuss in this article helped me! Most of us must have known that getting Google Adsense Approval these days is somehow stressful due to one mistake which google considered to be non-compliant or other issues. But if we know the cause of the disapproval we would be able to correct our mistakes then it will be very much easier for us to be accepted into Google Adsense Revenue program. 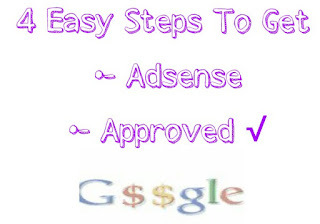 Read Adsense Policy Here for official details on how to get google adsense approval in 1 minute. well, I know there are many ways you could get Google Adsense account approval but in this case, I'm telling you out of my experience, I have read and tried many of those Adsense approval tricks on the internet but none seems to work out for me. But when i followed these 4 easy steps of getting Google Adsense account approval, I was accepted into Google Adsense revenue program. Google Adsense is the best paying-ads program for bloggers but at times to be accepted into the platform and to serve AdSense Ads on your site/blog might be so difficult but you should never give up, keep working hard and put your practice to work and by correcting what Google said it's your errors. STEP 1: Figure out what is really the issue with your site or blog that is not allowing you to get approval; is it plagiarism, insufficient contents, privacy policies issue? It's very important to know which of these is hindering you from not getting Google Adsense approval, find a solution to it and it fixes them. If it is plagiarism problem, and those contents are rightfully composed by you then what you should do is to make a proper editing, change some phrases and keywords or use any online plagiarism checker to show you where exactly is being plagiarised. But in my own case; I choose to delete everything on my blog which left my site with zero post then I start afresh because I was pretty sure that all articles on my blog as of then was all copied from other sites, and if you know you did the same Just like me “copycat” then you should follow my lead and delete all copied post from your site. And if your own case is that of insufficient contents then all you get to do is to write and post more articles on your blog in order to get approval. STEP 2: Start afresh with good and High-quality content. Do a thorough search on the topic which you want to write about as they might be another site that is already ranking for that particular post or keywords you are about to write on, read at least 4-5 articles from different sources on that particular topic to gather enough information and put them down in your own way but make sure you are giving the information about the same topic. STEP 3: In this step I may say it is absolutely out of my own experience, it's quite different from what I have been reading online about the specific amount of articles/Posts a blog should have before apply for Google Adsense account and get approval, I was having about 45 good posts on my blog before I resubmit the application after 2 months of deleting every single article on my blog and I got the approval but many people said that even 10-20 could get you approval but that's a blatant lie but I can't really tell the exact amount of posts. However, I suggest you should keep it between 40-50 unique articles because I'm 80% sure that this method will really work for you because it works for me perfectly, but keep it in mind that it will work only if your contents are original and unique. STEP 4: A custom domain plays a big role in this step, most especially when you are targeting a high cpc countries, Use a custom domain name for your Blogspot or WordPress site. Don't use someone's image (copyrighted images ⚠) in your post and make your site users friendly and easy to navigate with neat sidebars. That's not all but just a few to mention and I'm not forgetting a post worth recommending here How To Get Quick Approved For Google Adsense by Confy Scenty My Mentor and the brain behind www.contechsblog.com, a friend that I will never forget in a hurry. If you follow the above steps how to get Adsense approval for Blogspot will be very simple. When you get approval, then create ads units and start targeting Adsense high cpc countries 2018/2019 to increase your ads revenue. Are you looking for the top paying Adsense CPC keywords to make more money? Search click here for top high paying CPC, Adwords and Adsense Keywords for 2018/2019. 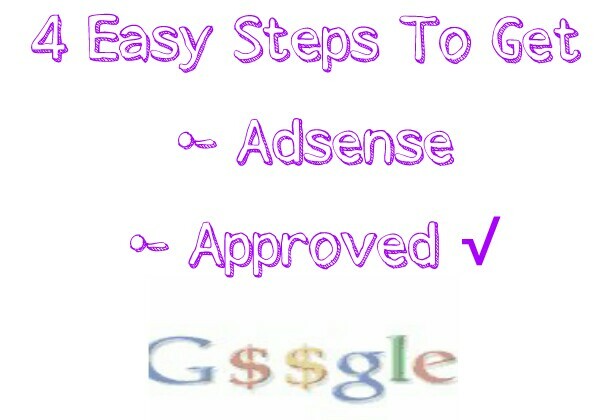 I hope you enjoyed reading my post on 4 easy steps to get Google Adsense approved? Please do let me know. You've really improved and am very happy your hard work is ready to start paying up. Your adsense approval adventure is one i know very well about, am glad you were patient enough to get what you truly deserved. Am very happy for you and this article is what recommending to any Blogger still on the Adsense approval journey, even though i do not agree with the believe you have about one getting approved with just 10 articles, it does happen though rarely.